… 19 years ago. But still excited! Last week marked the nineteenth year I have been married to my man. And it feels almost like something. Next year, now THAT will be a big year – a cruise-worthy, celebrate-able year. Next year will mark the year I will have been married as long as I wasn’t. This year was a low-key celebration, a go out to eat and finish a bunch of interrupted conversations kind of year. It was a year where these two lately passing ships docked in a harbor, glanced up and said, “Oh yeah! You! I still like you!” Because it’s been a grindstone kind of year, a just keep swimming kind of year. This hangs on my fridge, two fortune cookie fortunes. 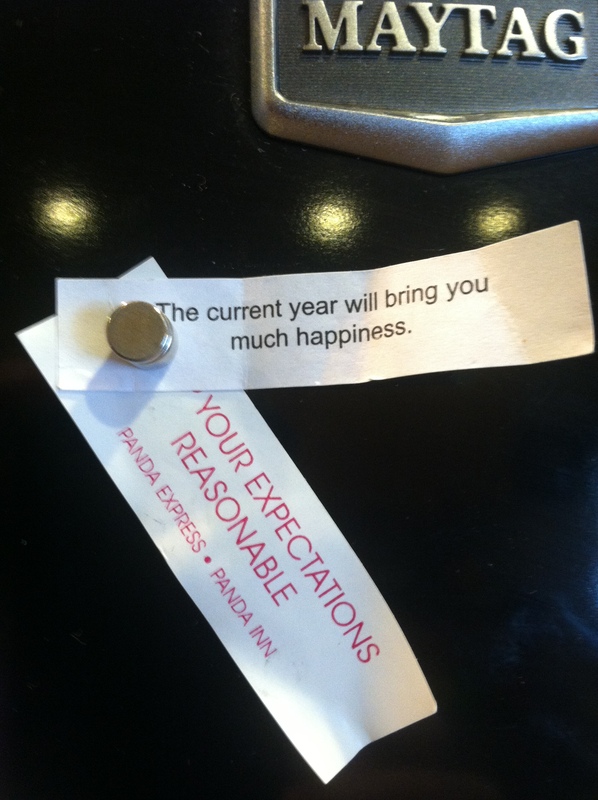 One says, “The current year will bring you much happiness” and the other says, “KEEP YOUR EXPECTATIONS REASONABLE.” I don’t think it’s a coincidence I got these fortunes within a week of each other. Nor do I think it’s a coincidence one is in all caps. It’s the kind of thing that must be yelled at me. Yes sir. There is something about my wedding anniversary that makes me take stock more than any other day. I know the New Year is when most people buckle down, take a good look, and make new goals. For me that happens November 26. It sort of works you know? Right near Thanksgiving when I’m feeling grateful anyway. It’s a good time for a sit-back-and-see-if-you-like-the-life-you-built kind of reflection. Not that you care, but I’m happy to report that yes. Yes. I do like this life I’ve built. But I’m way too tired for any goals. I’ve sought after and grabbed more happiness than I thought possible. I’m good with that for now. I’m the kind of goal-setter who gets slightly out of control. I have a dream binder and a separate categorized, illustrated goal-getting binder. I even marketed my “goal-getter” to others for a while. I guess because I’m crazy though – it never really caught on. Look, I don’t understand why everyone doesn’t want a binder with their long-term, short-term, and daily goals all written out and broken down into priorities. I think YOU are the crazy ones. So, I’m setting a goal not to let the goal-setting get out of hand. Oh the irony. You were expecting maybe since this is a post about my anniversary that I would say some nice things about hubs – right? Well, my hubs is the best hubs. Way, way better than your hubs. He is perfect. I mean, for me. Actually, you wouldn’t really like him at all as a husband. He’s messy and night-time snory and whatever your worst pet peeve is – the kind of guy you wouldn’t mind being friends with though – okay? Sometimes, my man, he sings me to sleep. Sometimes, he gets things just right. Sometimes, he holds all of the fragile pieces of me together. I think I’ll stick with him another year. Or forever. See, this is what I am talking about. I look forward to reading this. Your blog is on my top three that I look forward too. I appreciate this. 20 years of marriage is nothing BTW!!!! Ours wasn’t cruiseworthy, or any thing fun, romantic, or sappy! But what it was, two people still in love, learning, and growing. Happy Anniversary dear friend!